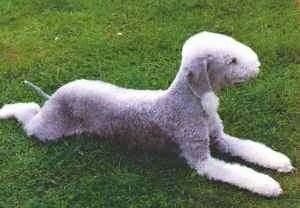 The Bedlington Terrier has the appearance of a little lamb. The dog's pear-shaped head is narrow, but deep and rounded. The muzzle is strong with no stop. The almond-shaped eyes are small and deep-set. The jaw meets in a level or scissors bite. The low set ears are triangular with rounded tips. The chest is deep and the back is arched. The back legs are longer than the straight, front legs. The tail is low set, thick at the root and tapers to a point. Dewclaws are usually removed. 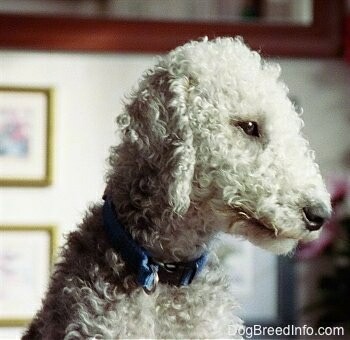 The Bedlington has a thick double coat of a mixture of hard and soft hair standing out from the skin. Colors come in blue, sandy, liver, blue and tan, sandy and tan, and liver and tan. Tan markings may appear over the eyes, on the chest, legs and rear. 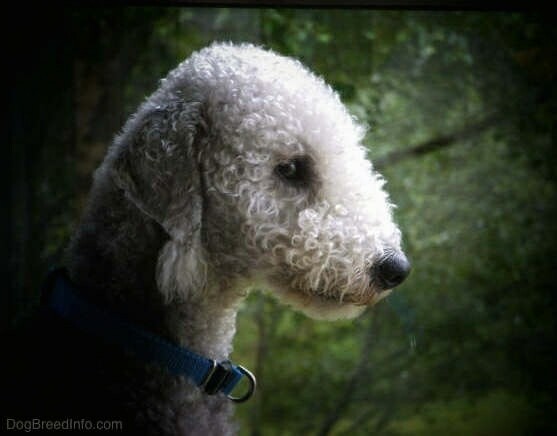 The Bedlington Terrier is playful, cheerful and affectionate, making a good family companion. Loving with children and fairly friendly with strangers it is loyal and lively, but can become willful and stubborn if it senses its owners are meek or passive. This breed needs to learn to get along with cats and other household animals when it is young. Usually they can get along with other dogs, but keep them away from those that want to dominate, as once challenged they are terrifying fighters, despite their gentle appearance. Often called a "little powerhouse," it is brave and energetic. It is an enthusiastic digger. They are super-fast runners and need to be taught to come back when called. Bedlingtons like to bark, and need to be told enough is enough if it becomes too obsessive. 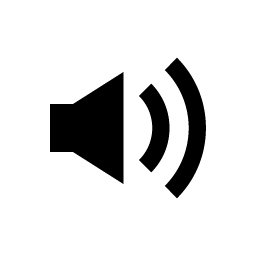 They can be high-strung without enough mental and physical exercise. Only let this breed off its lead in an enclosed area. Like the Whippet, he is fast and loves to chase! Be sure you are always your dog’s firm, confident, consistent pack leader to avoid Small Dog Syndrome, and separation anxiety. 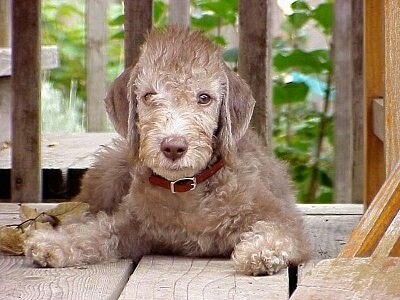 Bedlington Terriers may have a serious inherited liver problem known as Copper Storage Disease. They are also prone to hereditary kidney disease, PRA, thyroid problems and eye problems, such as cataracts and retinal disease. This breed will do okay in an apartment if it is sufficiently exercised. They are fairly active indoors and will do okay without a yard. These active dogs need plenty of exercise and, like other terriers, will be bored and mischievous without it. They need to be taken for a long daily walk. 17+ years; one woman reported her Bedlington lived to be 23 years old. The coat sheds little to no hair and requires specialized clipping every six weeks, so it is probably best if you learn to do it yourself. The coat is thinned and clipped close to the head and body to accentuate the shape. Shave the ears closely leaving a tassel on the tips. On the legs, the hair is left slightly longer. Brush the dog regularly and clean the pluck inside the ears. Although frequent bathing will not dry out skin as it does on so many other breeds, it should not be washed too often or the coat will become lank, which is not considered appropriate for the breed. Dogs that are to be shown require higher levels of grooming. This breed is considered good for allergy sufferers. The Bedlington Terrier was developed in and named after the mining town of Bedlington in the country of Northumberland, England. The original name for the Bedlington Terrier was the Rothbury Terrier, named after the district of Rothbury located on the English border. 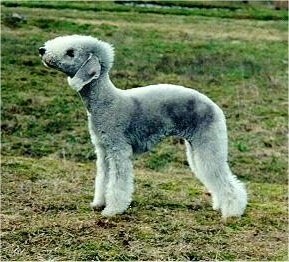 About 1825 the breed was renamed the Bedlington Terrier after the Bedlington Mining Shire. The breed was a prized hunting dog of foxes, hares and badgers. It was also used as a vermin hunter by the miners of Bedlington. The miners exploited its gameness as a fighting dog in the pits and hunters used them as retrievers. Both the Otterhound and Dandie Dinmont Terrier are possible contributors to the breed. Some breeders, especially those in England will cross Bedlingtons with Whippets and Greyhounds to produce what they call Lurchers.